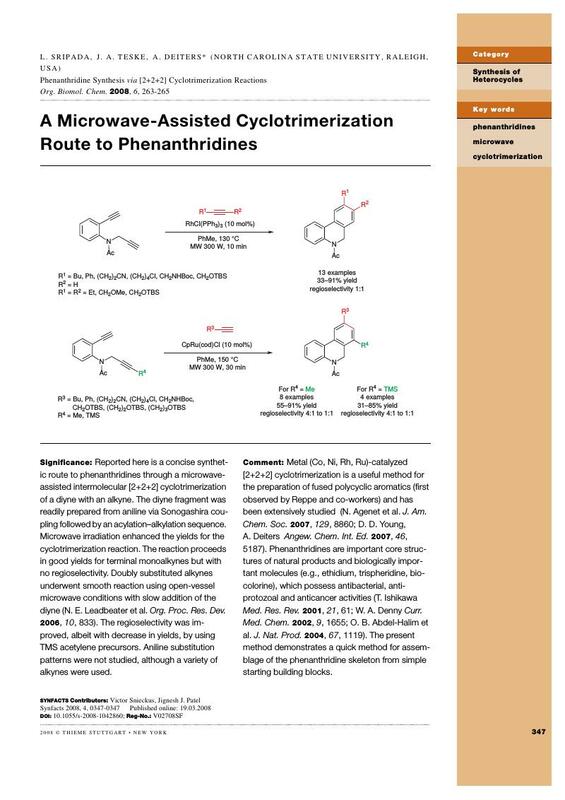 Reported here is a concise synthetic route to phenanthridines through a microwave-assisted intermolecular [2+2+2] cyclotrimerization of a diyne with an alkyne. The diyne fragment was readily prepared from aniline via Sonogashira coupling followed by an acylation-alkylation sequence. Microwave irradiation enhanced the yields for the cyclotrimerization reaction. The reaction proceeds in good yields for terminal monoalkynes but with no regioselectivity. Doubly substituted alkynes ­underwent smooth reaction using open-vessel ­microwave conditions with slow addition of the diyne (N. E. Leadbeater et al. Org. Proc. Res. Dev. 2006, 10, 833). The regioselectivity was improved, ­albeit with decrease in yields, by using TMS acetylene precursors. Aniline substitution patterns were not studied, although a variety of alkynes were used.